Lois Curfman McInnes is a senior computational scientist. Her research focuses on numerical algorithms and software for the parallel solution of PDE-based applications and related optimization problems using the PETSc/TAO library. McInnes co-leads work on the Extreme-scale Scientific Software Development Kit (xSDK) and the IDEAS software productivity project, dedicated to engaging scientific software teams to identify and adopt practices that improve productivity and sustainability. She received a Ph.D. in applied mathematics from the University of Virginia in 1993. She was named a SIAM Fellow in 2017 and won the 2015 SIAM/ACM Prize in Computational Science and Engineering (with collaborators). She also won an Ernest Orlando Lawrence Award in 2011 for outstanding contributions in research and development supporting the Department of Energy and its missions. 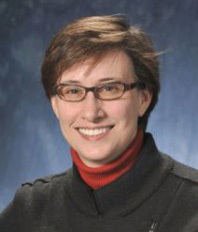 McInnes served as chair (2015-16) and program director (2013-14) of the SIAM Activity Group on Computational Science and Engineering; she is co-chair of the 2018 SIAM Annual Meeting and serves on the SIAM Education Committee and the editorial board of SIAM News.